In the unfortunate event of a bulkhead failure you have to address the situation in a timely manner. 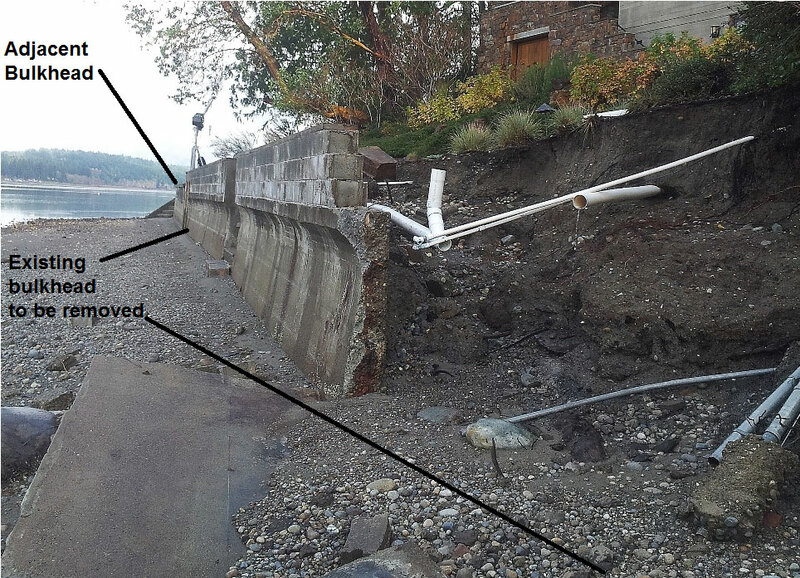 In this situation, the bulkhead failure left about 20 linear feet of wall gone, exposing the bank behind it. The new house that was just built is located about 23 feet back from the bulkhead wall that had failed. The scope of work was both long and short term. We had to protect what was left and minimize any further erosion while getting permits and a construction plan together for the long term solution. The long term solution was to construct and new bulkhead one that is called a soldier pile bulkhead. These bulkheads consist of steel H-beams/I-beams that get driven every 8 lineal feel along the shore line. In between the steel beams, there are inserts that are placed in between the steel flanges. Treated wood, Steel and concrete can be used for these inserts and for this project we used concrete panels. These concrete wall inserts had to be custom fabricated which was a job in and of its self. To hold the wall from falling over again we also had to drive tie backs that anchored into the bank that holds the new wall from tipping forward. The challenges we faced during this project were: How distant the job site was from Seattle, the tidal fluctuation, rocky shoreline permits, and job site access. Mobilization to the site was difficult. Although it does get worse, the job site was located in Union, Hood Canal. By car this is a 2 hour drive from our home base in Seattle. From water we have to get a barge outside of lake Washington which includes traveling under 3 low bridges and getting dropped thorough the Government locks in Ballard. From there the barge has to Travel up to Port Ludlow which is 25 miles, then down Hood Canal 75 more knots, or a total 90 miles. 90 miles may not seem like a long distance, but when you are only moving 5 knots an hour it takes a long time, about 18 hours, getting through the Ballard Locks can take 1-2 hrs alone. Permitting was challenging as well. 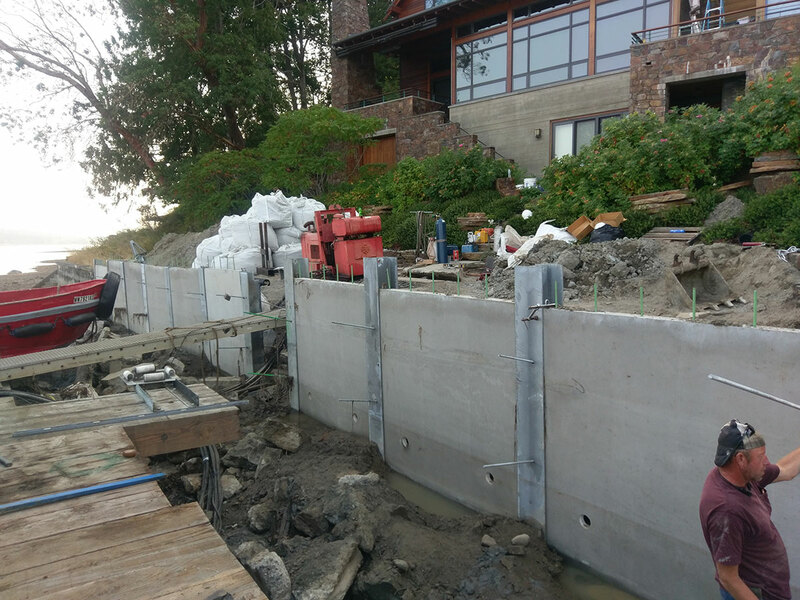 After a year all was going well until we got an email about one year into this process that stated they wanted to re-review this project and explore other bulkhead options such as soft shoring instead of a soldier pile bulkhead. The agencies had a shift in employment, a new guy, fresh out of college though he would try to make this shore line project more environmental friendly. The problem wit this is what the house’s foundation is elevated 18ft up and 23 ft back from the base of the bulkhead. A soft armoring of sand and gravel mixed in with scattered logs and boulders would not be possible because of the location of the house and the slope of the bank. Convincing the agency that I choose not to identify that we needed to replace the bulkhead with a hard shoring vertical bulkhead took another year of back and forth emails and phone calls. This project took two years to permit meanwhile the slope directly under the houses foundation was slowly eroding. The tidal movement is huge. The further south you go down Hood Canal or Puget Sound the bigger the tidal movements become. Down in Union, Hood Canal, we were getting + 14ft tides and – 4ft tides. The high and low barometric pressure can also play a part in the tidal movement a couple feet plus or minus. The problems associated with tidal fluctuations are: The barge grounding out on the rocky beach and punching a hole in the barge or, the work area going underwater for a portion of the day. While only having seaward side access also meant that if we put a machine on the beach and left it there, the machine would get swamped with salt water and total it. If the barge gets left high and dry on the beach it gets holes and then sinks when the tide returns. In a given day we would only have 2-3 hours of a window to get a barge in close enough to get any pile driving down. To deal with this constantly changing tidal fluctuation we build an elevated crane platform that enabled the pile driving crane to stay above the high water line at all times. When we needed to move down the bulkhead we shifted the platform that was constructed in partitions.